At Ben & Nino Auto Repair & Towing Service, we specialize in 24-hour towing and roadside assistance. We truly care about two things: automobiles and your safety. That’s why we’ve dedicated ourselves to meeting all of the auto and towing needs of people in the Brooklyn, New York area. For our customers in White Sands, Brooklyn, we’re more than happy to help with all towing and auto repair needs. Keep reading to find out more about our various services. To learn even more about Ben & Nino Auto Repair & Towing Service, please call us today at (718) 339-8500! You can’t predict when you’ll have a problem with your car, truck or motorcycle. But if you do experience a problem that leaves you stranded on the side of the road, give us a call. We offer 24-hour towing — so we can get your vehicle towed and on the road to recovery as soon as possible. And even better, we can tow just about anything — cars, lightweight trucks, 4x4s, motorcycles, motor homes and even construction equipment. As the renter or owner of a property, you shouldn’t have to deal with illegally parked vehicles blocking your driveway. But unfortunately, this can be a reality of living in Brooklyn. However, at Ben & Nino Auto Repair & Towing Service, we’re happy to tow any illegally parked vehicle that’s blocking your driveway. We’ll do this for any commercial or residential customer. If you have an old, non-working car sitting on your property, creating an eyesore and taking up much-needed space, don’t worry. At Ben & Nino Auto Repair & Towing Service, we’ll get rid of it for you. And, because we offer 24-hour towing services, we’ll tow your junk car any time of the day or night. Dead car battery? No problem. We’re more than happy to give your battery a jump — or even replace the battery if it won’t restart. Flat tires can happen anywhere and any time. We understand! That’s why, as part of our roadside assistance service, we’re here to repair your flat tire. If your tire is too damaged to be repaired, we’re happy to sell you a replacement tire. Forgot to fill up your gas tank? Didn’t keep an eye on the gas gauge? Don’t worry. If you ever run out of gas, we’ll deliver fuel to you as quickly as possible. Interested in our towing or roadside assistance services? Ben & Nino Auto Repair & Towing Service is your source for towing, 24-hour roadside assistance and much more in White Sands, Brooklyn. Since our inception, we’ve built a strong reputation with our customers located in and around Brooklyn, New York. 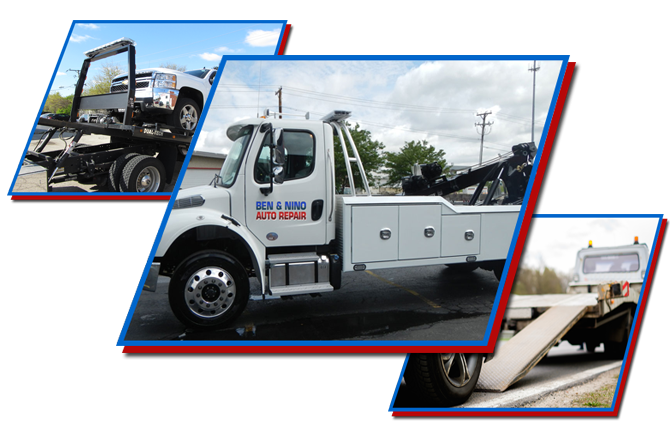 From our ASE-certified mechanics to our large fleet of tow trucks, Ben & Nino Auto Repair & Towing Service is the trusted name for all of your towing and auto repair needs. Whenever you need towing help or roadside assistance in White Sands, Brooklyn, call Ben & Nino Auto Repair & Towing Service at (718) 339-8500!